Church pew decorations usually match the wedding color scheme and repeat the overall theme. A few creative ideas can inspire unique designs that portray the bridal couple's personal style. The ends of pews are most typically decorated with some sort of contemporary bow or traditional floral arrangement with a modern twist. Long gone are the large and shiny satin bows once fixed to the end of pews at weddings. While wedding bows are still a popular option, they take on many forms beyond the large looped option. Bows can be made from virtually any material, from rich velvet to hand-tied raffia. 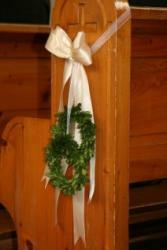 Many modern bows feature long ribbon strands than hang down to the bottom of the pew. If you cannot decide between a pew bow or a flower bouquet, consider combining the two options into one. Use a traditional bow and take out the center loops, attaching a small bloom or two in the center. Hang a small wreath to the bottom of a long ribbon bow. You could even make a traditional blow and cover it with miniature faux flowers so it looks like the entire thing was woven of blooms. Almost anything can be turned into a pew decoration if you have a small option that doesn't break easily. In fact, you could even spray paint plastic wine glasses and hang them upside down from a church pew with a ribbon for a vineyard themed wedding. Depending on your religious background and the church rules, you may be restricted in what can be placed in the church sanctuary for decoration on the pews. For example, some churches may only allow decorations that include religious icons, like hanging crosses with flowers from the sides of pews. 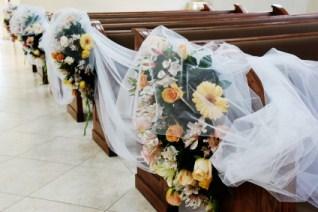 Others may have a set of pre-approved pew bows and faux flower decorations from which you can choose amongst. In any case, it is always best to get your design approved before you order your pew decorations. Besides the actual design, restrictions may also be placed on how you can affix the decoration to the pew itself. Look for plastic clips or attach a small ribbon for hanging the decoration. Do not use staples or adhesive, as it may cause damage to the pews. The pew decorations are a finishing detail that adds just enough embellishment to create a festive atmosphere for your wedding. Combine the pew decorations with altar flowers and other church decorating tips and you'll have all the decorating details taken care of for your ceremony.